• 'Systems of large lightly reinforced walls'. The seismic response and performance of the first two types of systems has certain undesirable features. Consequently, these two types of systems are singled out to be penalized with low values of the behaviour factor q. The low q factors aim at protecting better these two inherently more vulnerable systems by keeping their response closer to the elastic range and at the same time serving as a disincentive (or warning) against the use of such systems. The systems of large lightly reinforced walls are differentiated from those of uncoupled ductile walls not in the value of the q factor, which is the same, but in the dimensioning and detailing rules, which are fundamentally different. There is no differentiation among the remaining three types of systems (frame, dual and coupled-wall systems), either in the value of the behaviour factor q (which is the same and the highest among all the types) or in their design rules: the dimensioning and detailing of a beam, column or ductile wall, coupled or not, is the same, regardless of whether the member is part of a frame, dual or coupled-wall system. As far as design is concerned, a very important distinction is between (1) frame or frame-equivalent dual systems on the one hand and (2) wall or wall-equivalent dual systems on the other. The columns of the former should (in general) fulfil the strong-column-weak-beam rule, in order to prevent formation of a soft storey and promote beam-sway mechanisms; in the latter, this ultimate target is meant to be achieved merely by the presence of ductile walls, sufficient in number and dimensions to force the entire structural system to stay straight while swaying. For similar reasons (i.e. 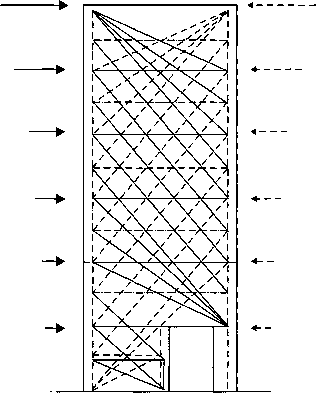 owing to their walls), structural systems listed in point 2 are not considered to be affected by any masonry infills during the seismic response, and therefore are not subject to the special design and detailing rules that the systems listed in point 1 have to follow, in the presence of such infills. The main features of the different types of structural systems recognized in Section 5 for concrete buildings are discussed in overview below, along with their implications for the design.